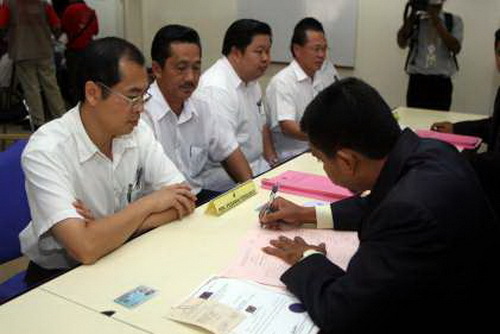 Vital step: File picture of the nomination for the Berapit state seat in 2008. If any nomination paper is rejected, the decision of the returning officer is final and shall not be called in question in any court. The nomination process for the coming general election is bound by the Elections Regulations (1981) which have stringent rules. COME this Saturday, at least a thousand candidates will present their nomination papers for the 13th general election. They will vie for the 191 parliamentary seats and 505 state seats in peninsular Malaysia and Sabah, and 31 parliamentary seats in Sarawak. However, their nomination papers can be rejected by the returning officer if the candidates are not capable of or are disqualified from standing in the election or their nomination papers are not in compliance with the Elections (Conduct Of Elections) Regulations 1981 (ECER) made under the Elections Act, 1958. Under Article 47 of the Constitution, a candidate must be a citizen of not less than 21 years old resident in Malaysia. > has resigned from the Dewan Rakyat less than five years ago. Article 49 of the Constitution also prohibits a member of the senate to stand for election unless he has first resigned from the senate. The phrase “office of profit” is defined by Article 160 as any full-time office in any of the public services. The “public services” are as set out in Articles 132 and 160(2) and they include the armed forces, the judicial and legal service, the general public service of the Federation, the police force, the joint public services, the public service of each State, the education service, the Auditor General, members of the Election Commission or any corresponding Commission established by the Constitution of a state. The ECER, on the other hand, sets out the conduct of the nomination proceedings and what must be done; failing which it will render the nomination papers to be rejected. The ECER was last amended by the Elections (Conduct of Elections) (Amendment) (No. 2) Regulations 2012 which came into effect on April 30 last year. 1. A candidate must present his nominations papers to the returning officer between 9am and 10am on nomination day. 2. A candidate must submit the original copies of Form 4 (nomination form) and Form 5 (statutory declaration) for a parliamentary seat and Forms 4A and 5A for a state seat. The forms must be accompanied by a deposit or a deposit receipt of RM10,000 for a parliamentary seat and RM5,000 for a state seat. The candidate will lose his deposit if he fails to poll more than 1/8 of the total number of votes polled by all the candidates in the constituency. The deposit can be returned to the candidate only if he withdraws his candidature before 10am on nomination day or he dies before polling day; otherwise it can only be claimed within one year after the election result has been published in the Gazette. 3. The nomination form must be signed by the candidate, his proposer and seconder and the witness who witnesses the signature of the candidate. The statutory declaration is not required to be stamped as it is exempt from duty. 4. The proposer and seconder must be registered voters of the constituency for which the candidate seeks election. This requirement does not apply to the candidate or the witness. As a result, it allows political parties to expediently “parachute” at the eleventh hour candidates registered elsewhere to stand in any constituency even though a similar requirement may well help create a pool of talented and capable local politicians. 5. A candidate is not allowed to withdraw from this candidature after 10am on nomination day. This is a new law and a welcome move to prevent the occurrence, in particular, of any corrupt practice. A candidate should note that ECER specifically provides that failure to comply with paragraphs 1 to 4 above will render his nomination papers to be rejected. > only the returning officer, a member or officer of the Election Commission, the candidate, his proposer and seconder are entitled to be present during the nomination proceedings unless a person is requested by the returning officer to assist him. > after the nomination papers have been submitted between 9am and 10am, the candidate, his proposer and seconder may still make corrections on the nomination papers in the presence of the returning officer. However, the 2012 amendments to the ECER have now removed the previous provisions allowing any registered voter in that constituency or candidate to object to any nomination paper on any of the above-mentioned grounds between 10am and 11am. In other words, it is the returning officer who will now solely examine and then decide whether to accept or reject the nomination papers. > If any nomination paper is rejected, the returning officer shall inform the candidate or his proposer or seconder of his decision and the grounds for rejection. The decision of the returning officer is final and shall not be called in question in any court. However, any person aggrieved by the returning officer’s decision may still challenge it by presenting an election petition under section 32(b) of the Election Offences Act 1954. Hence, it is hoped that no candidate will make a mistake on any of the above; otherwise he is indeed not fit to be elected. Lastly and for the benefit of the readers, it is good to know how ECER deals with the use of indelible ink. ECER provides that a ballot paper will be given to a voter after, inter alia, his left forefinger has been marked with indelible ink. No ballot paper will be given to the voter if he refuses to show his left forefinger to prove that no indelible ink has already been marked or he refuses to have his left forefinger to be marked. It follows that if the voter’s left forefinger is missing or cannot be marked for whatever reason, then one of his left fingers will be marked. If all his left fingers are missing, then his right forefinger or another one of his right fingers will be marked. If he has no fingers at all, then the indelible ink will be marked on the end of his left or right arm.